Coventry Baths were opened on 23 April 1966 and granted Grade II listed status by English Heritage in December 1997 meaning they are "of special interest, warranting every effort to preserve them". I am proud to say that my dad, Michael McLellan, was the principal architect and was awarded an MBE in 1984 for services to architecture. I recently came across the Coventry Memories website which has more info on the baths. Included in that are scans of a substantial article published at the time of their construction in the trade magazine the Architects Journal. At the time of the listing he rang up English Heritage to find out more. Chatting to the young lady there (at his age they are all young) he was amused when she said, "It's so nice to talk to the actual architect - they're usually dead!" Below is the description of the listing from Heritage Gateway. Swimming Baths with attached sunbathing terraces. Designed 1956, built 1962-6 by Coventry City Architect's Department, under Arthur Ling and Terence Gregory; Michael McLellan principal architect, Paul Beney assistant in charge. Steel frame, suported on four main stanchions set outside the building envelope with much use of cantilevers, clad in brick with large areas of glazing. At upper levels mosaic finish of expressed trusses replaced in powder coated metal that is sympathetic to original intentions. Set on a tight site, an enfilade of three pools set in a single hall, the largest pool 'T'-shaped to include a diving area. This projects on the south elevation, which is particularly impressive, with full glazing round five sides. This has strong internal mullions, while externally the mullions and transoms form an even grid. The interior is particularly impressive. Main pool hall with seating for 1,174 spectators has 165' pool with diving area in projecting 'T'. Small teaching ppol set in low ceilinged space under projecting cafe and viewing area, with small pool beyond. These retain original brick and tile finishes. 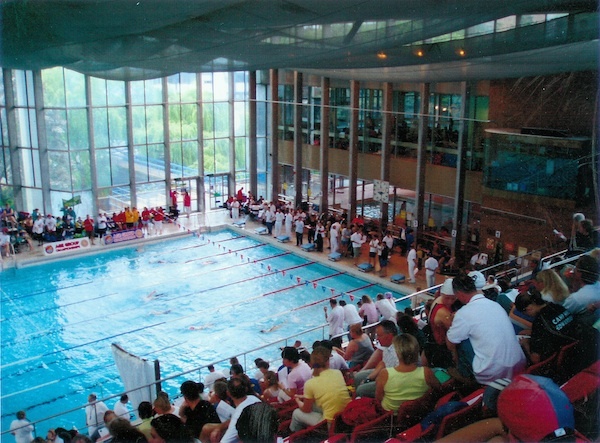 The elaborate facilities of the main pool were designed to meet international competition standards, and the pool became the regional competitive centre for the Midlands - a recognition of the impressive facilities provided rather than an original aim. Later sports hall to east with bridge link not of special interest. Wartime bombing destroyed four of Coventry's five swimming baths. By 1956 the city decided that its needs would best be met by a very large central complex. 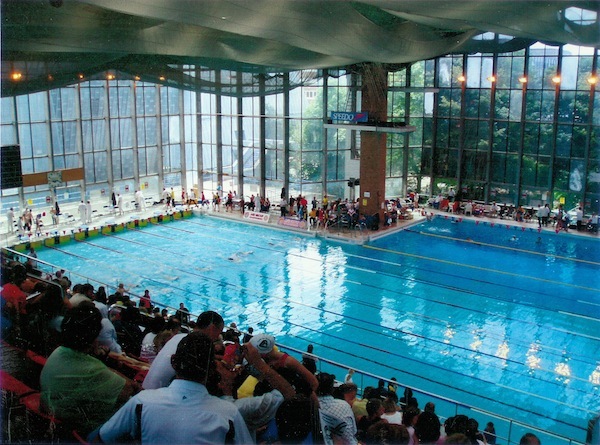 Coventry and Hampstead were the only complexes of the period to be constructed with three pools, and at Coventry all three remain in use. The use of a steel frame and the longitudinal plan are also unusual features. Coventry is important as amongst the most ambitious baths built anywhere in Britain in the short period 1960-66 when large swimming complexes were encouraged. It is also one of the few buildings in the rebuilt Coventry centre to be a pure modern design: 'Coventry has been provided with one of the finest swimming pools in the world. It has probably no equal in Europe, and local pride has reason to be satisfied. ... The site for the Swimming Baths was constricted and the requirements complicated. Yet the result is undoubtedly an architectural success. The enormous bird-like form has an imaginative and dramatic elegance which outclasses any of the other recently erected buildings in central Coventry.' (Coventry New Architecture).